Vertical-banded gastroplasty, commonly known as "stomach stapling" or a sleeve gastroplasty, is a restrictive weight loss surgery that works by decreasing the amount of food that is able to be consumed before feeling full. 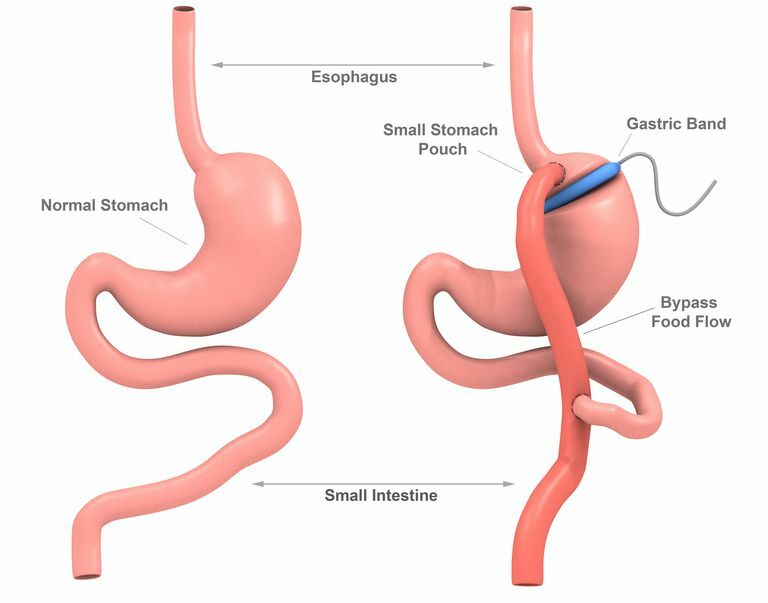 This surgery combines aspects of stomach stapling and gastric banding, but is not adjustable. It is easily confused with other similar procedures, such as the vertical sleeve gastrectomy, which does not include a band. Like other procedures that include a band, it is less common today than it was in the past, as the bandless gastric sleeve procedure gains popularity. The surgery isolates a small section of the stomach for processing food, limiting the size of meals to approximately one ounce, and slows digestion by forcing the food to pass through a restrictive ring. While lap-band surgery uses a restrictive ring, the surgeries are very different, lap band requires no incisions on the stomach while vertical-banded gastroplasty creates a hole in the stomach for the band to loop through. In addition, the lap-band is can be adjusted as needed without surgery and the restrictive band in vertical-banded gastroplasty cannot be modified without surgery. The patient who undergoes this procedure must make radical changes in their food intake and lifestyle in order for the procedure to have a successful outcome in the long term. Because the stomach has the ability to stretch to accommodate food, the stomach can expand greatly from the one ounce capacity. Meals should be very small and drinking fluids with meals can fill up the pouch. The surgery is typically performed in a hospital or a surgery center, using general anesthesia. Most surgeries are performed laparoscopically, which allows the surgeon to use long instruments placed in the body via incisions a few centimeters long (instead of opening up the abdominal cavity and creating a large scar). In some cases, though the surgery will be performed "open" with the larger traditional incision, or a surgery that begins laparoscopically may be converted to the open procedure when the surgeon determines it is necessary. The surgery begins with multiple half-inch-long incisions in the area of the stomach. The instruments are inserted through these incisions and the surgeon begins by making an incision in the stomach. The sides of the incision are stapled, creating a hole in the stomach through which a restrictive band is threaded, decreasing the speed with which food can leave the stomach. Above the newly created hole, the stomach is stapled, forcing digested food to leave the stomach through the banded area. Once complete, the area of the stomach that digests food holds an ounce of food or less. Once the surgeon determines that the staples are holding the stomach closed and there are no areas that appear to leak, the instruments are withdrawn and the incisions are closed, typically with sterile tape. This procedure has mixed results in the long term, which vary from regaining all of the lost weight to maintaining 50 percent of total weight lost. Many patients have difficulty maintaining the tiny portions required to keep the stomach pouch size small. When they begin to consume larger portions, weight loss stops and weight gain often begins. The intestine is not bypassed in this procedure and there is no change in the way the body digests food in the intestines, so there is no risk of malnutrition due to the surgery. Total weight loss and long-term weight maintenance is the lowest for this surgery when compared to all types of bariatric surgery currently being done in the United States, so it is not recommended for people with a very large amount of weight to lose and/or who are candidates for other procedures. In fact, it may be preferable to work toward changing modifiable factors and have a different procedure when you qualify rather than having a procedure known to have less weight loss in the short and long term. The vertical banded gastroplasty is not as common as it once was, with Roux-En-Y and gastric sleeve surgeries leading as the most frequently performed weight loss surgeries. For most individuals, exploring all of the options that are currently available would be of benefit, as many of the newer procedures have a higher rate of success with overall weight loss and long term loss maintenance.